Chail is 44 km from Shimla and 45 km from Solan. It is situated at an altitude of 2,250 m. It lies between 30.9697°N 77.1975°E. Once the summer Capital of Maharaja Bhupendra Singh and later of his son Maharaja Yadvendra Singh of the Patiala State is a reminder of lavish life style in the lap of the Himalayas. About 43 Kms. from Shimla, and located on a spur, Chail affords a splendid view, on a clear day, of the valley through which the river Sutlej flows, overlooking, at the same time, both the glittering town of Kasauli and the splendid city of Shimla. On the other side rise the massive Himalayan ranges, spectacular in sun and snow. 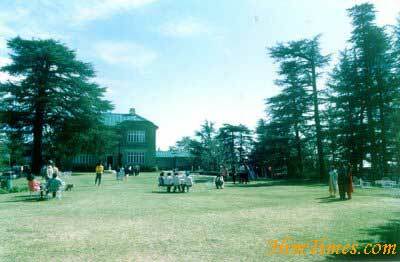 Chail is built on three hills one of which is topped by Chail Palace and the other by the ancient temple. Maharaja Bhupendra Singh of Patiala loved to play cricket and he developed the highest pitch in the world, on the third. 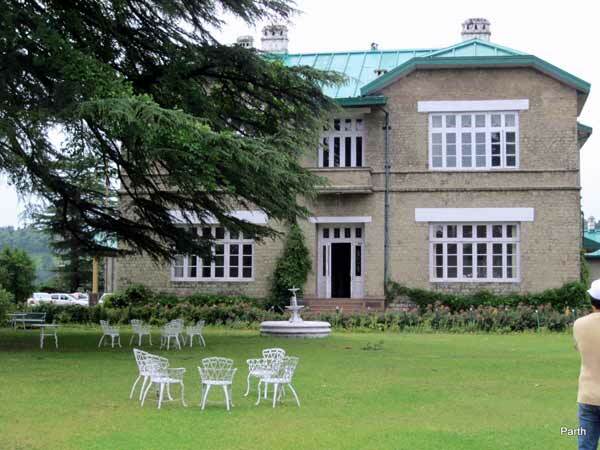 Nestling in the shelter of virgin forests which cover many untrodden hills, Chail is a tiny resort in the Shiwalik region of Himachal Pradesh, and has interesting history. Originally, it was a part of Keonthal State. Then it came under the sway of the Gorkha warrior Amar Singh. Finally it became a royal resort and summer seat of Maharaja of Patiala. The story behind the rise of Chail as the summer seat of Patiala state is quite interesting. The present Chail is spread over an area of 72 acres on three adjacent hills-the Rajgarh Hill where the Palace is built, the Pandava Hill where the old Residency ‘Snow View’ is located and where the British Resident lived, and finally the Siddh Tibba, where the temple of Baba Sidhnath is located at a height of 2226 ft.
Chail is connected by road from Shimla via Kufri, the distance is about 45 km and via Kandaghat it is 61 km. Kalka is 86 km away. Regular buses for Chail leave from Shimla, Chandigarh and Delhi. The closest airports are at Chandigarh (120km) and Shimla Jubber Hatti Airport (63km). 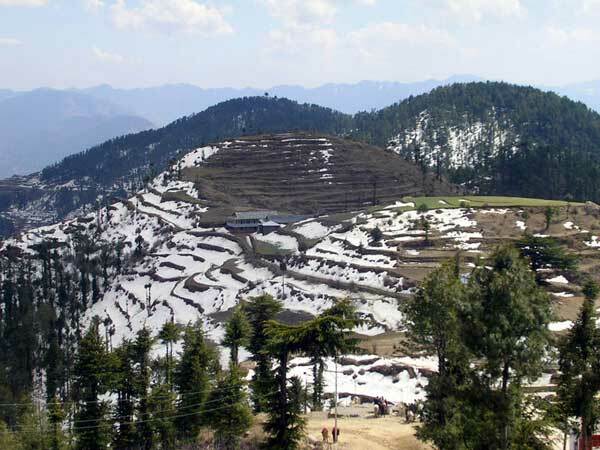 Snowflake Travels, The Mall, Shimla organizes sight-seeing tours to Chail. In winter the temperature can drop below freezing point when heavy woolens are required. In summer the climate is mild and light woolens/cottons are recommended. Maharaja Bhupinder Singh orginally began building his Palace at this site. It is said that a “Sidh”, saintly person, appeared before the Maharaja in a dream and declared that this was the place where he had meditated, Bhupinder Singh shifted his Palace and built this temple instead. The palace of the Maharajas, built in the late 19th century and the pretty cottages of the complex – that once accommodated the ADCs and guests of the royal party – are now part of a charming holiday resort, owned and run by HPTDC. Chail has lovely walks and trails that meander through the dense pine forests – the home of barking deer, wild boar, pheasant and a variety of birds. Forest Rest Houses make overnight halts possible. For those interested in sports, Chail has fine tennis and squash courts and a putting green. There are excellent spots along the River Gaura, down in the valley, with opportunities for anglers to tangle with the Himalayan Mahaseer, a local fish. 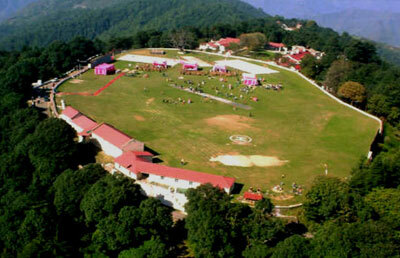 Chail has also the highest cricket ground in the world – 2,250 m above sea level. Built in 1893, after leveling the top of the hill, the Cricket Ground stands at 2444m and is the highest cricket pitch and polo ground in the world. A long and enjoyable drive through lush forests and quaint villages takes one to the small but highly popular hill station of Kufri. Its main attractions are the Himalayan Nature Park, a small high-altitude zoo, and the exciting trek and horse rides that leads to the divine Mahasu peak. The Chail Sanctuary has “Choral”, “Kakkar, “Sambhar” (Deer variety), red jungle fowl and “Khalij” and “Cheer” pheasants. Machan-like sighting posts have been built near a place called blossom and at Khariun. The deodar and oak forests and grasslands around the town are part of the sanctuary. One can see sambhar, ghoral and cheer pheasants at Blossom and Jhaja – where there are pheasant breeding centers. Barking deer and khalij pheasant are often spotted at dusk and dawn in the sanctuary. Treks from Chail to Gaura and Chail to Jhaja are popular. (1360 m) : Halfway between Kandaghat (12 km) and Chail is this village with a bridge astride the Ashwani stream. A good picnic spot.